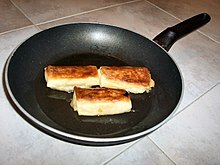 However, Tefal was not the only company to utilize PTFE in nonstick cookware coatings. In subsequent years, many cookware manufacturers developed proprietary PTFE-based formulas, including Swiss Diamond International, which uses a diamond-reinforced PTFE formula;Scanpan, which uses a titanium-reinforced PTFE formula; and both All-Clad and Newell Rubbermaid's Calphalon, which use a non-reinforced PTFE-based nonstick. Other cookware companies, such as Meyer Corporation's Anolon, use Teflon nonstick coatings purchased from DuPont. In the 1990s, it was found that PTFE could be radiation cross-linked above its melting point in an oxygen-free environment. Electron beam processing is one example of radiation processing. Cross-linked PTFE has improved high-temperature mechanical properties and radiation stability. This was significant because, for many years, irradiation at ambient conditions has been used to break down PTFE for recycling.This radiation-induced chain scission allows it to be more easily reground and reused.